First Thelonious Monk, now Frank Zappa. Compared to the heat Miller Brewing has drawn for using famous rock ‘n’ roll artists on a series of cans, it looks like small breweries – in this case both from Northern California – are on to something. 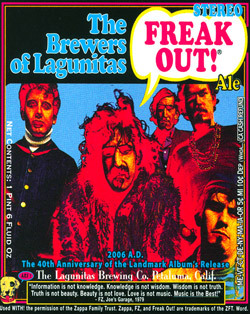 Lagunitas founder Tony Magee obtained the permission of the Zappa Family Trust to use the original album art as the bottle label. He plans to do an entire series commemorating the release of Zappa albums. So look for “Absolutely Free” next summer. Freak Out! Ale is a beer of substance (7.3% abv) but – thank goodness – is not as demanding as Zappas’ double album. It has plenty of hop character – citrusy, resiny, gritty flavors and solid bitterness – to balance hefty malt sweetness (fruit and caramel). Lagunitas also announced that its Imperial Red Ale (also not for sissies), previously sold only in 22-ounce bottles, is available in six-packs of 12-ounce bottles. Where can I buy Lagunitas Freak Out! Ale on Long Island NY or NYC area? Had a few pints last night at Vallejo’s Wednesday night celebration… Excellent Beer! Goes real good with some Jambalaya. I found a bottle of Lagu Freak Out at Whole Foods in N. Calif. You folks have Whole Food stores in NY? A quick-and-almost-too-easy 22 ounces for sure; I love it! And you should also note that it’s *stereo* Freak Out! ale — check the label. Where can I get Freak Out! in Cleveland, Ohio? I have been trying to find Zappa Freak Out beer on Long Island NY since Sept 6th and can’t find it. The Lagunitas regional rep based in NJ has been uncooperative and even obstructive and no distributor seems to be able to make any headway. My local distributor was told it would ship to him two weeks ago and still does not have it! Where can I buy Zappa Freak Out beer on Long Island before you stop brewing it? This ale is bun’s up kneelin’, and it’s got me wheelin’ and a dealin’!!! Wowy zowy,is there a slight chance we can treat our taste buds with these suds up here in the great white north. All of us frenchies are just waiting impatiently to be able to put our hands and mouth on this exceptional product .Isn`t this the best way to celebrate 40 years plus of pure genius. Bring it on,we are ready and waiting. Have a whole case of 22 ozers in the basement chillen. Bottles are looking for a home. I’d be interested in the case, don. Any chance of scoring any bottles of ‘Freak Out? I’m in baltimore and just had a bottle of ‘Kill Ugly Radio’. Excellent idea, although by the time I can afford to come to the USA there should be 50+ Zappa beers waiting for me. Didja Get Any Onya?